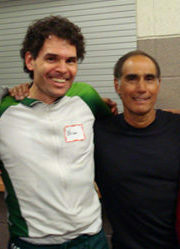 I am on the left standing next to Stu Mittleman who ran across the country in 56 days. Amazing! Welcome to Denver Running Coach! • What are your goals for running? • Are you planning to run your first 5k, half or full marathon, and don’t know what to do? • Have you run a few events and are you frustrated with your results because you are not achieving your goals. such as a specific time goal, and/or qualifying for the Boston Marathon? • Has your training been set back because of injuries that are costing you money with the physical therapist, chiropractor, physician, and preventing you from training effectively? • Are you confused as to how to train because you are overwhelmed by all of information available online, from books, magazines, other people you run with, so-called experts, etc.? • Are you pressed for time because of other life commitments (family, job, etc.)? • Or, do you have a crazy, hectic schedule that doesn’t allow you to train consistently? 1. Customized training programs developed specific to your goals, fitness level, schedule, running and injury history with the opportunity for guidance and support provided through weekly coaching calls or emails. 2. Running form evaluations to determine which improvements can be made with your running form to make you a faster runner and decrease your risk of injury. 3. Individual coaching sessions to provide guidance and address your specific running needs, including speed, pacing, strength, endurance, etc. See Coaching Services for more details. “I highly recommend Brian as a running coach. After failing to achieve my time goal for my first three marathons, I hired Brian to coach me for my fourth marathon, based on the recommendation of my sister. Brian worked with me through four months of training leading up to the marathon. He took great care to understand my running history, overall health and fitness, history of injuries, and general constraints on training for a marathon. Every Sunday without fail, Brian sent me a specific and detailed plan for my three runs for the following week, and stretches and suggestions for what to do on non-running days (e.g. Yoga and functional training exercises). All of my runs were challenging, but not so challenging that I couldn’t do them. Brian also did a good job of “mixing up” my weekly running plans such that I never got bored, and had me doing workouts that I wouldn’t have thought of on my own (like hill sprints!) As my training progressed, he also adjusted my paces to better reflect my paces during my running workouts the week before. I am a 49 yo male, and I had done four marathons with a PR of 3.30. I engaged Brian as a running coach to help me make it through a very challenging Machu Picchu marathon in Peru and then to attempt to qualify for the Boston Marathon. Brian worked with me to understand my current situation, the amount of time that I could devote to training, and to understand my running goals. Brian crafted very specific weekly training programs for me that included strength training, warm ups, a variety of runs for each day, and cool downs. I did not experience periodic injuries working with Brian that I had faced before. Brian made himself available to talk to me each week to answer any questions, discuss progress and suggested changes and review the plans for the upcoming week. I ended up coming in third in the Peru marathon, and I qualified for the Boston Marathon two weeks ago, shattering my PR in the process to 3.10.45 and beating my Boston qualifying time by 15 minutes! I am still in shock. I attribute much of that outperformance to working with Brian. I highly recommend his coaching help. “I have been a runner for over 40 years. I have run marathons, half’s, 10Ks, you name it. Over the last 10 years, however, my times have been getting progressively slower. I knew what to do but it just wasn’t having an impact. After one month of training with Brian, I just ran a 5K in my fastest time in 10 years. Six weeks later, I ran a half-marathon hoping to improve my time by 15 minutes. I ran across the finish line with a huge smile on my face – I had beaten my last half-marathon time by a full 25 minutes!! All the information presented on the Denver Running Coach website is for educational and resource purposes only. It is there to help you make informed decisions about health-related fitness issues. It is not a substitute for any advice given to you by your physician. Always consult your physician or health care provider before beginning any exercise program. Use of the programs, advice, and information contained in this website is at sole choice and risk of the reader. In no way will Denver Running Coach or any persons associated with Denver Running Coach or Enlightened Performance LLC be held responsible for any injuries or problems that may occur due to the use of this website or the advice contained within. Denver Running Coach and Enlightened Performance LLC will not be held responsible for the conduct of any companies and/or websites recommended within this website.